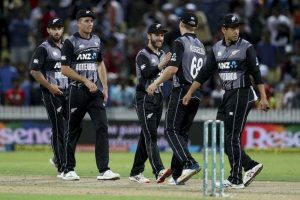 HAMILTON, NEW ZEALAND – Colin Munro’s blazing half-century and Tim Southee’s last over to defend 15 runs helped New Zealand seal the T20I series 2-1 with a four-run victory in the decider at Seddon Park. The defeat also meant India faced their first series loss on their long tour of Southern Hemisphere. After being put in, Munro’s 40-ball 72 and Tim Seifert’s 43 off 25) set the platform for a daunting total. 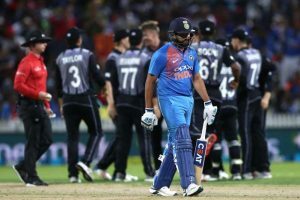 While India dismissed Munro and Kane Williamson in back-to-back overs, New Zealand had by then motored to 150 in 14.4 overs. Colin de Grandhomme ensured the hosts didn’t lose the momentum with a stroke-filled 16-ball 30, with Daryl Mitchell and Ross Taylor applying the finishing touches. The stand was broken when Seifert was ruled out stumped by Chris Brown, the third umpire, in yet another questionable decision in this series. Kuldeep Yadav drew the batsman forward and beat the outside edge with a tossed up googly. MS Dhoni whipped the bails off and replays showed Seifert might have had some part of his back foot behind the line before the bails came off. However, the third umpire thought differently and didn’t take much time to rule the batsman out. That, however, didn’t impact Munro much. While Kuldeep troubled both him and Williamson with his wrong’uns, runs kept flowing from the other end. Munro hit another six and four off Krunal in the 11th over of the innings to take the side past 100. India weren’t helped by their sloppy fielding either. In one Hardik Pandya over, Khaleel dropped Munro, Vijay fumbled to concede a boundary, and as if to add insult to injury, Munro smashed the next ball for a six. Munro eventually fell to Kuldeep, going for his sixth six of the innings, but by then New Zealand were all set for a massive total.